Fylde Wedding Cars have a wide choice of Executive and Vintage Chauffeur driven wedding cars including our 1929 Austin 12/4 Burnham and the prestigious executive S-Class & E-Class Mercedes saloons, whether you go for the old or the new wedding cars will not fail to make your special even more perfect. 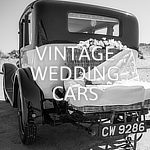 We have a range of vintage wedding car rental packages to meet any budget. Mercedes wedding car hire come with a competitive minimum hire period of Two hours. Our immaculately presented cars come with all the luxury expected from leading marques and can be supplied with ribbons and flowers as requested. Our wedding car service will transport the Bride and Groom on their special day in style and comfort. The interiors are finished to the highest level of luxury and will make a great feature in any wedding album. We don't just provide transport for the Bride and Groom on their special day, we are able to provide luxury People Carriers for the Bridesmaids, or for the Parents of the Bride and Groom. The most popular Choice is the Mercedes Viano People Carrier which can carry seven people in comfort, providing the Bridal party with plenty of room for their elegant dresses. Do you have larger groups of guests that require transfers to the wedding venue? 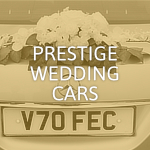 Then Fylde Wedding Cars can organise mini coaches or larger vehicles as required.